Home to the notorious "Blue Book," which listed the names and addresses of every prostitute living in the city, New Orleans's infamous red-light district gained a reputation as one of the most raucous in the world. 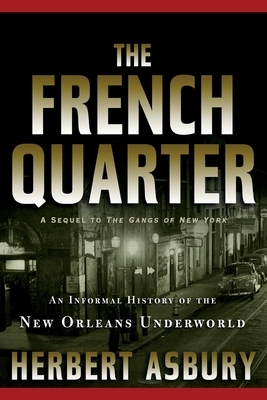 But the New Orleans underworld consisted of much more than the local bordellos. It was also well known as the early gambling capital of the United States, and sported one of the most violent records of street crime in the country. In The French Quarter, Herbert Asbury, author of The Gangs of New York, chronicles this rather immense underbelly of "The Big Easy." From the murderous exploits of Mary Jane "Bricktop" Jackson and Bridget Fury, two prostitutes who became famous after murdering a number of their associates, to the faux-revolutionary "filibusters" who, backed by hundreds of thousands of dollars of public supportthough without official governmental approvalundertook military missions to take over the bordering Spanish regions in Texas, the French Quarter had it all. Once again, Asbury takes the reader on an intriguing, photograph-filled journey through a unique version of the American underworld.